MySQL is a full-featured open-source relational database management system (RDBMS) that was originally built by MySQL AB and currently owned by Oracle Corporation. It stores data in tables that are grouped into a database, uses Structured Query Language (SQL) to access data and such commands as ‘SELECT’, ‘UPDATE’, ‘INSERT’ and ‘DELETE’ to manage it. Related information can be stored in different tables, but the usage of JOIN operation allows you to correlate it, perform queries across various tables and minimize the chance of data duplication. MySQL is compatible with nearly all operating systems, namely Windows, Linux, Unix, Apple, FreeBSD, and many others. It supports various storage engines, like InnoDB (it is the default one), Federated, MyISAM, Memory, CSV, Archive, Blackhole and Merge. 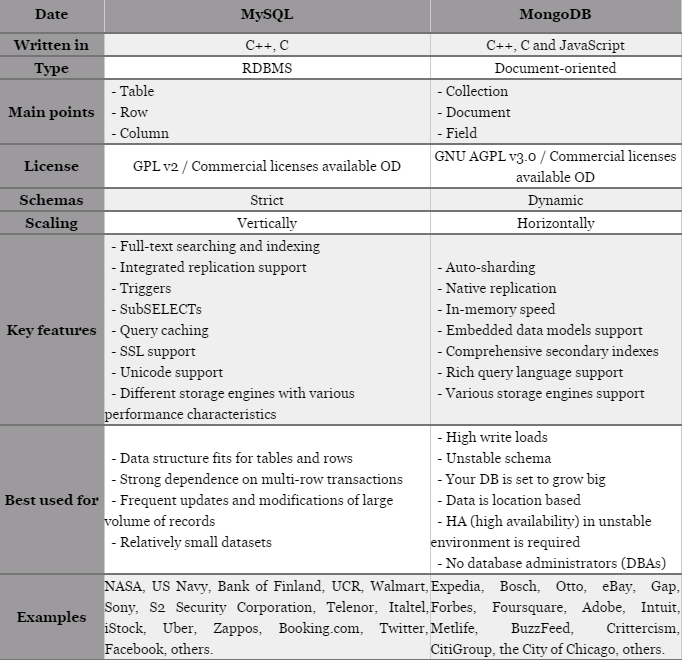 One of the top benefits offered by MongoDB is the use of dynamic schemas that eliminates the need to pre-define the structure, like fields or value types. Such a model allows hierarchical relationships representation, array storage, and ability to change the records structure by simply adding or deleting fields. This NoSQL solution comes with embedding, auto-sharding, and on-board replication for better scalability and high availability. 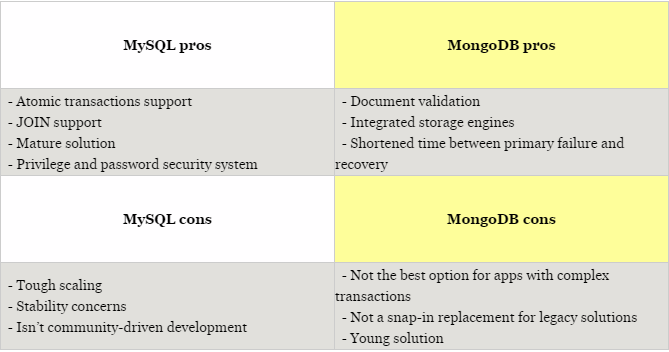 Interesting to read: Databases in Details: How to Choose the Right One?